Coasteering at Surf-Lines Adventures CoasteeringEvery summer we introduce many adventurous people to the excitement of this excellent activity. Coasteering is a great way to explore Anglesey's west coast - following the foot of the cliffs, close to the water's edge, we climb from bay to bay, scrambling over boulders and gullies. We often swim past harder sections, to simply enjoy being in the water. Add the sea caves and cliff jumps and you've got a fantastic outdoor adventure! This is a great activity for all ages and abilities. We can make the session as exciting or accessible as you like - it's a great experience for a mixed-ability group. Action-packed with climbing, jumping snd swimming, it's a great team activity. 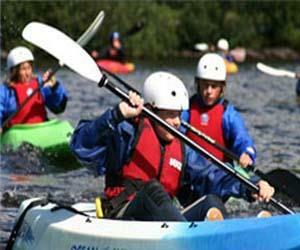 We'll kit you out with full wetsuits, buoyancy aids and helmets - you'll just need swimming tgs, an old pair of trainers and warm clothing to wear after the activity session. Every summer we introduce many adventurous people to the excitement of this excellent activity. Coasteering is a great way to explore Anglesey's west coast.